This sort of guide explains how to archive and store safely the patches for FFXI so that you don’t have to download and reinstall 700+ Mb of patches in the case you have to format the hard disk. If you are on dial-up (ISDN, in my case) you know how *painful* this could be. 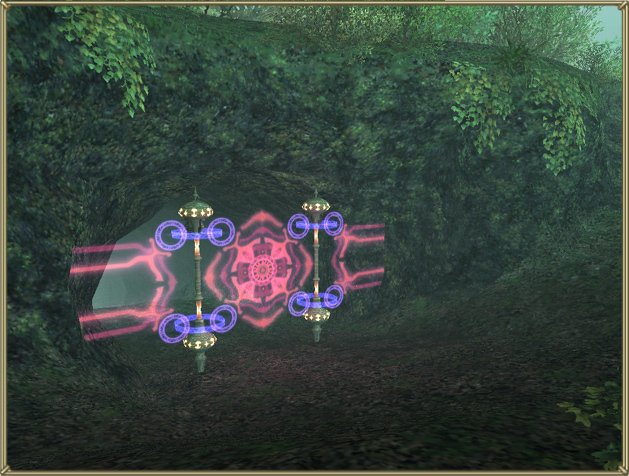 Now FFXI has already an horrible installation. Yes, the game is huge and has a lot of content but if we consider the low resolution textures and the reused assets there’s really no justification for an installation that arrives at 6.75 Gigabytes. It’s just insane. I’m not sure about the causes but my suspect is that it’s a raw, direct port of the PSX2 version, so that they can keep updating both client without double work. It seems that the PC version is more like an emulator that parses the data file and makes them work as they are on the console. The result is that we have this insane installation as the consequence of a data format that isn’t really appropriate for the PC. A confirmation of my suspects came after I (successfully) tried to save and archive the patches. I reinstalled the game recently, I have the original american version with Zilart included, plus Chains of Promatia CDs. So I had the game client updated to September of the last year, when CoP was released. Basically about a year of patches to download and apply. Which translates to about 3500 files for a grand total of 700+ Mb to downlad again and install. The surprise was when (after more than eight hours of download) I finally zipped those files to burn them on CD once for all. With Winzip set on “normal” compression the final archive was barely above 300Mb. Now my question: why Square doesn’t send these damn patches compressed and then expand the files when they are already on the PC? You know, it would “just” hugely impact the server load when a new patch is released and it would be a positive improvement for all those players that aren’t on broadband and that do not like to spend hours waiting the new patch to download. In particular when for each update there’s the need to rescan all the files. A process that takes alone more than *30 minutes* on a Ultra-ATA hard disk. I guess this comes along the other inexplicable, annoying quirks of the game I listed at the end of another article. Beside these “pointless” disquisitions. I have a rather simple way to save those patches so that you don’t have to redownload them in the case you need to reinstall the game. Unfortunately, this is possible only if you “plan ahead” to build the archive since you cannot save the files after the client is patched successfully. So if you want to save those files you need to restart from a clean installation and go through the upgrade process at least once (or save only the most recent patches that will be released in the upcoming months). If you do this (or will do when you’ll have to reformat/reinstall), remember to install the original game, Zilart and CoP. I underline this because the three installations don’t start automatically and if you leave an expansion out you’ll have to redo most of the patching. So install everything in the proper order, launch PlayOnline and the update to the game. At this point the client will check all the files one by one (the 30+ minutes scan) and then start to download those that changed (at this moment, with all the expansion installed from scratch, it’s about the 3500 files I pointed above). Those files will be stored in the game directory before they will be actually installed. In order to catch and save them you have to *stop* the updating process before the installation of the files happens. So I suggest to stop the update when only 10 or so files are left to download. When you reach this point and PlayOnline is halted, you should go on Windows start menu -> Search -> For Files and Folders. Here you select “all files and folders”, then in the “look in” field you select the directory where you installed the game and in the name field you insert *.tmp2 which is the extension of the files downloaded before they are installed. And press “search”. If you followed the instructions you’ll get an endless list of .tmp2 files. You go to the “edit” menu, press “select all” and then right click on the files. If you have Winzip you’ll have an option saying “Add to Zip”. You select it, give a name to the archive you want and, most importantly, select the “save full path info” checkbox. And press “add”. The archive will be built and once done you can burn it on CD or put it wherever you want. When you’ll have to reinstall the game you’ll just need to decompress the archive in the game directory (pay attention so that the files go in the right place) and launch the update from PlayOnline. After the scan is over the client will see that the files are already available and will install them directly without redownloading them. Which is exactly the goal of this guide. I didn’t test directly if it’s possible but I believe you can then work with Winzip to update the archive with the latest files when a new patch is released. So that you can keep just one archive instead of one for each different patch released. I guess I could upload the archive on the site and make it public as I do with WoW patches, but for now I think I’ll avoid the option. I lost the install CD 2 and 3 despite I usually keep care and store safely my games. Thanks to eMule that wasn’t a big problem. Speaking about the utility of P2P. Final Fantasy XI is still fascinating and unique on many different levels despite some radical flaws that some players considered almost show stopping. One of these aspects is the unique attempt to build one community as an hybrid of different cultures. Mixing together japanese, american and european players. Something that was harshly criticized by many players and that I always praised as a valuable goal to pursue, despite the difficulties. I wish I could find a very old thread on Grimwell where I discussed the merits of the approach while everyone else was trying to demonstrate me that it wasn’t a laudable attempt to chase an utopia but just a solution of convenience to spare the money and cut the risks by supporting just one centralized server farm. Sadly the days of people jumping off their chocobo because they see a low level playing with a non-Japanese name struggling to travel through a high level zone are over. Most of the Japanese players are still going to be polite and the vast majority who are still playing also speak English, but after experiencing NA players for the last year and a half they’ve taken to saying “no thank you” too. I know who I’d rather be playing with. What is sad about the whole issue is how some of the awful mechanics of the game put the two communities one against the other. I believe that the divergencies came mostly as consequences of competitive PvE systems that just weren’t appropriate for the original goal of the game. I’m speaking in particular of the camping of the NM (Notorious Monsters). I don’t know directly the system but from what I heard different parties gather up around the spawn points and need to “tag” the monster before everyone else. This simple, awful (unfun) mechanic brought to many conflicts between the two communities, Especially considering how the system was perceived as unfair toward NA players. Being the servers in Japan, the japanese players could benefit of a faster reaction and so a sensible advantage over those playing from another continent. It’s obvious how, when the cohabitation is already shaky, every little detail can break things beyond repair. In particular when a system is perceived as a “cheat” favoring the opposite faction. That’s the principle that can start a collision which can easily deteriorate from that point. It builds factions and hostility. It builds differences because the “other” is perceived as a stranger that is violating a competitive space. – Players will no longer be able to use spells or abilities to claim a monster as soon as it appears. The way I see it, this update fixes the JP latency advantage. As stated by an earlier poster, the JP advantage is *very* small. It is less than human reaction time. So that means, by the time a JP player would be reacting to a HNM on their screen, its already appeared on a NA player’s screen as well. Of course, this gives a JP player a huge advantage when spamming a macro, or using a turbo controller to spam voke. In that case, the JP player doesn’t need to react to the HNM appearing in order to claim it. This being one of the reasons why King Behemoth is one of the most JP-dominated HNMs across all servers. KB’s spawn is nothing but a spam-fest. The only other monster in the area is a lone Thunder Elemental. Much different camp than Fafhogg or Aspidochelone, which require a player to target the HNM through a field of other monsters to get claim. So, the latency advantage give JP player’s a headstart in spamming matches. but thanks to the new update, you can’t spam anymore. A JP player can spam voke all window long, but then KB will pop, the JP will provoke, and…. oops! Nothing happens because he voked to early, and now his voke is disabled for a little while. (definately longer than it’ll take for KB to get claimed by someone else) Since spamming doesn’t work anymore, HNM camps will now be about which player has the best reflexes, not about who lives closest to the server or who can best ignore the pain of jamming the enter key for half an hour. See? We are back at considering the development time and the absolute necessity to spend time in the community instead of being isolated from it. This was one huge flaw of the game that was almost trivial to fix. But the devs of this game are between those more out of touch with the actual situation of the game. This fix comes two years too late. Yes, the gameplay will improve considerably but it will be almost impossible to heal that wound that split the two communities apart and made them hostile (or that at least had a role, if you don’t share my simplified point of view on the cause of the hostility). The other positive trait I wanted to point out is between those I already reported (in the edit). The players can now have access to personal henchmen that can be considered as “pets”. Not only they are supposed to help when the player cannot find a decent group, along with the modifications to the experience points from easy mobs (FFXI has huge LFG problems considering that it’s basically impossible to solo), but they became an extremely interesting feature on their own, even outside their specific purpose in the gameplay. The fun of reasearching their (undocumented) complex behaviour and the possibilities of customizations brought to one of the most entertaining threads I’ve ever read. 460 posts (at this moment) progressively discovering the depth of the system and its possibilities. An investigation so fun (even to read) that quickly replaced the actual purpose of the henchmen to become one fun toy on its own as the new focus of the gameplay. As a result, this is impressive. Squaresoft added once again an unique feature with an unparalleled depth and detail. Carefully planned to have different facets to discover and enjoy instead of becoming trivialized into a simplified and functional system without anything else to offer. And that’s the “magic” of this company. They don’t plan their games just as functional systems that do their work and nothing else. Instead they add this depth and care for the personality, so that each little story and character presented has its own special role and flavor. Its own quirks to discover on multiple levels. This is what crafts a type of roleplay that makes the game so rich and unique compared to every other mmorpg out there. That’s also when a game can impose its originality and break the cliches of a genre without suffering from this estrangement from the common places. All this brings to a game that you cannot easily trade with something else. When you leave FFXI you know that you won’t be able to find the same flavor and feelings somewhere else. This is why I felt always fascinated by this game in an unique way. But at the same time I was never able to accept its radical problems that just killed the experience for me. From the horrible patch process that doesn’t allow you to store the patches (and an insane install above 6Gb as result of an horrible port of the data files), the ridiculous billing system, the policy to delete the characters and account after three months of inactivity and the impossibility to play in a window without recurring to hacks. That’s already more than enough without even counting the actual game and the flaws of its design (in particular the insane group requirements). FFXI is one game part of that “if only” group. It could be the best mmorpg out there… if only. I didn’t expect it this year, but Squaresoft released the fifth detailed report (the second released to the american public) as they did a year ago. The first thing jumping to the eye is that they removed completely the numbers from the charts. While the main focus of the report of the previous year was to flaunt the great success that the game was having, this year the approach is way more modest and quiet. As if the comeback campaign wasn’t enough of a demonstration, it’s rather obvious that the numbers of the game do not shine anymore as for the past year. Even FFXI is suffering the release of better games along with a “flat development” that isn’t really improving or addressing the problems of the game. Based on data compiled at the end of March 2005, we conducted research on the main job levels of over 1,550,000 characters belonging to over 500,000 registered users. To begin with, these 500.000 registered users aren’t specified as active. Secondly, from the last news we had in September I was estimating around 600k of active subscriptions or more. 550k confirmed for sure. So it’s now fair to assume that the game is stalling and starting to see a slight decline. To notice the number of level 1 characters between the total pool of 1.5M, rises from the 34% of the last year to 41% – Mules for the win! Excluding level 1 storage characters, characters up to level 20 comprise around 55% of the total population. Compared to last year, there has been a 1% increase in the number of level 30 characters, which can be attributed to the effect of level-restricted areas in the Chains of Promathia, and also to players attempting to quest for extra jobs. The number of characters of level 50 and above has increased dramatically to 24% from 15% last year, while characters of level 71 and above have increased by almost 5% to 9% this year. The second one is from World of Warcraft. One of the most awful “features” of Final Fantasy XI is that if you unsubscribe for three months (or something similar, I forgot the details) your characters are gone and even your account is disabled permanently. So if you ever decide to come back you’ll need to buy a brand new box+expansions and restart from zero. Now they are about to launch a comeback campaign. They’ll re-enable old and deleted accounts for free (starting from the 14 April) and even restore old, deleted characters on demand. The details aren’t actually so clear but it seems that you have up to 30 days of “free” play with your restored characters, then you’ll have to pay the normal fee if you decide to keep playing. Now I wonder. If Squaresoft actually has all the backups of the characters, why they do not use this directly as a permanent feature? Why they decide to delete characters and account in the first place if they keep backups anyway? Just to be unpopular and prevent old players to come back when they choose so? Final Fantasy XI, also known as another painfully slow mmorpg to release relevant changes, has massively patched today. Just the new Fishing System deserves a page on its own. Squaresoft is starting to do something about the farmers. Not only they began to take actions against them. But now they are finally also addressing the awful mechancs that *produced* that situation. So we have changes to the notorious monsters and this new fishing system that finally looks interesting. Probably superior to the timid attempt in World of Warcraft. Now you have to actually “fish”, reacting to the movement and the stamina of the fish in order to successfully pull it out the water. I guess the default AFK-(macro)-fishing will be a bit harder now. A right step to deliver some more gameplay and address the farming problems. I also noticed that these patch notes make sense and are more detailed. Maybe Squaresoft is also reconsidering the communication process. Maybe they saw as well the subscriptions numbers sinking. There’s also a new, rather complicated, search system that allows the players to set categorized messages. It doesn’t sound so straightforward in how it’s integrated in the UI. Probably one of those features forgotten and abandoned by the players in two days. The world of FINAL FANTASY XI is now home to more adventurers than ever before, with over 550,000 active players logging on during the same day, and a record 170,000 players logged on simultaneously on September 18. This is hard to compare because we are used to the number of subscriptions but I still have to point out that for each character you need to pay one more dollar and the game was at 500k *subscribers* when the population was of 1 million active characters and 140k users logged at the same time. But there’s an even bigger aspect to consider. There are a max of 170.000 users logged into 30 unique servers. This means an *average* of 5.600 users on *each* server. Simply awesome. And we are probably above 600k subscribers. Blizzard, remember this when you consider your localized server of 2000 players and terrible off-peaks.